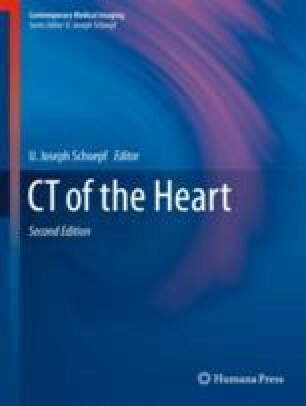 Thanks to its power to exclude significant coronary artery stenosis in patients with low and intermediate coronary artery disease (CAD) risk profiles, coronary CT angiography (CCTA) has become an integral part of the non-invasive diagnostic work up for the anatomic evaluation of the coronary arteries in patients with suspected CAD. Nevertheless, CCTA remains a morphological technique and the hemodynamic relevance of coronary stenosis is not adequately predicted by purely anatomical tests. Computed tomography myocardial perfusion imaging (CTMPI) offers the possibility to directly detect the presence of perfusion defects in the myocardium following the administration of pharmacological stressing agent. This emerging technology has the potential to become the stand-alone method for the evaluation of patients with suspected CAD using a single imaging modality, and within a single imaging session. This chapter will provide an overview of dual-energy CTPMI.